Excerpted from Navigating Your Lifepath by Carla Woody. In Part I, I wrote about ayni, which can be loosely translated from the Quechua as “sacred reciprocity.” In my estimation, it bears exploring over and over again, as we can dip more deeply into the meanings that rest beneath the surface. 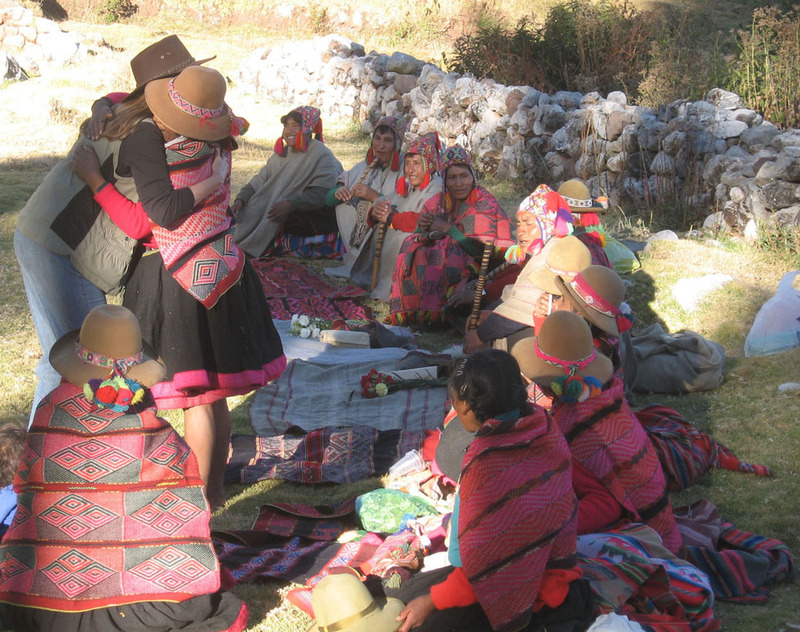 Ayni is not merely a concept, something nice to talk about, to the people of the Andes and other Native peoples. It is an actual day-to-day practice so embedded that they don’t even question it. The author greeting Doña Carmina and other Q’ero waikis (friends) before a despacho (blessing) ceremony outside Cusco. In Western culture we think more in terms of giving and receiving. I give you something. You owe me something in return. In the Andean tradition there’s a much different flavor to giving and receiving. It has to do with the support of the entire community, not just one person. If one person knows how to do something very well and the other person doesn’t, the one who has the skill automatically shares the teaching. The reciprocity comes to the first person in two ways. First, the teacher is validated for her knowledge base and may also learn more through the teaching. Maybe even more importantly, the entire community benefits because there are now two people with added value instead of just one. In 2004 I heard a radio program on global cultural change called “Andean Harvest” on Worlds of Difference that lent a further distinction to ayni and its influence. The interview took place in one of the mountain villages in Peru and had to do with the potato crop, of which there are a few hundred varieties. The challenge had to do with the farmers growing more of the different kinds of potatoes and getting them to market. To do so would give the opportunity to increase their livelihood. As a part of this undertaking, they were being advised by outside sources. But the farmers rejected most of the sources’ advice. In the interview one of the elders said, “We will do nothing that would put one of us in competition with the other.” He went on to explain that introducing competitiveness would negatively impact the overall health of the community. What he said gave me pause and a great deal of consideration by contrasting it with my home culture. In Western culture, competition is considered healthy, naturally a part of our capitalistic society. Sports teams compete. Sportsmanship behavior is encouraged. But there are a few other strange, although familiar twists, which get in the way and preclude the practice of true ayni as yet. The programming of our society says that success means we have to “be somebody.” That translates to a profession: doctor or lawyer but not “merely” a mother or father. If we define our worth and identity through career choice, or lack of thereof, there’s a huge convolution to the psyche; it sends the ego scrambling. The natural follow-on is one of competition, individual gratification, the need to “win” in order to be validated. The behaviors that come of this particular mindset produce not community, but a fractured society generating discordant energy. Competition introduced into locales such as those in the Andes would create confusion, disrupting their underlying spiritual tradition. People there are known not so much by what they do, but by who they are. Many of the shamans and mystics that I have come across in Peru and elsewhere can determine who we are by seeing our energy field. That tells everything. A light energy field and the intent to evolve are what garner respect, not a livelihood. Witnessing our own thoughts and actions is a slippery slope at best. The ego has all kinds of rationale to convince us that what we do is for our own good and that of those around us. Coming from the culture we do, unconsciously ingesting what we have, we perform a service to ourselves, and ultimately our communities, by being alert and wiser than the ego mind. The Core Self insists on it. Here are a couple of questions to consider. – How do you find the level of competition around you? – How can you make space for and “sponsor” others? Go to Sacred Reciprocity, Part I.